7-9 Massachusetts / 504 Beacon is located on the NW corner of Beacon and Massachusetts Avenue, with 490-492 Beacon to the east, across Mass. Ave., 506 Beacon to the west, and 491 Beacon to the south, across Beacon. 7-9 Massachusetts Avenue (502 Beacon) and 504 Beacon were built separately but functioned as a single building from the time they were constructed. Both buildings were designed by architect Obed F. Smith and built by Charles A. Dodge, mason, for Gamaliel Bradford. 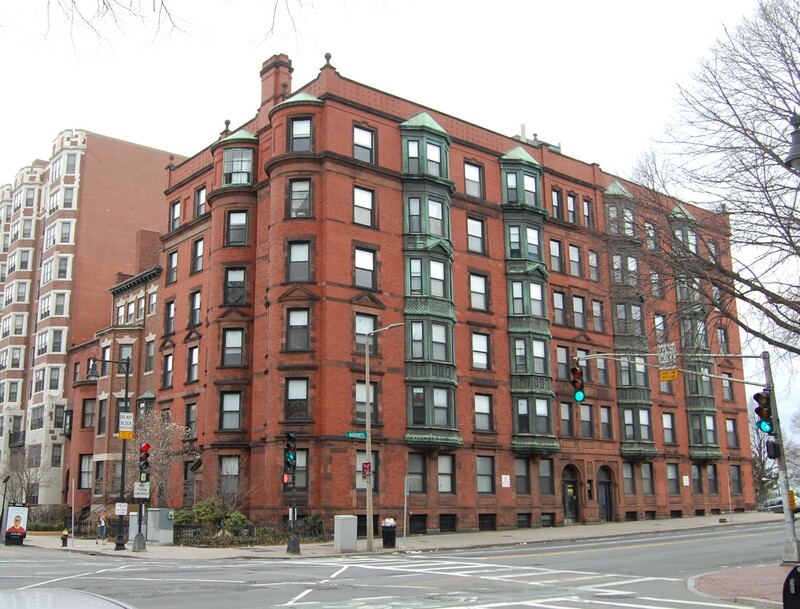 7-9 Massachusetts Avenue was built in 1888-1889, and 504 Beacon was built five years later, in 1894, as an annex to the original building. Gamaliel Bradford is shown as the owner of 7-9 Massachusetts Avenue on the final building inspection report, dated July 27, 1889. and on the original building permit application for 504 Beacon, dated August 9, 1894 (the original permit application for 7-9 Massachusetts Avenue and the building inspection report for 504 Beacon have not been located). Gamaliel Bradford purchased the land for 7-9 Massachusetts Avenue on March 30, 1888, from the Boston and Roxbury Mill Corporation. 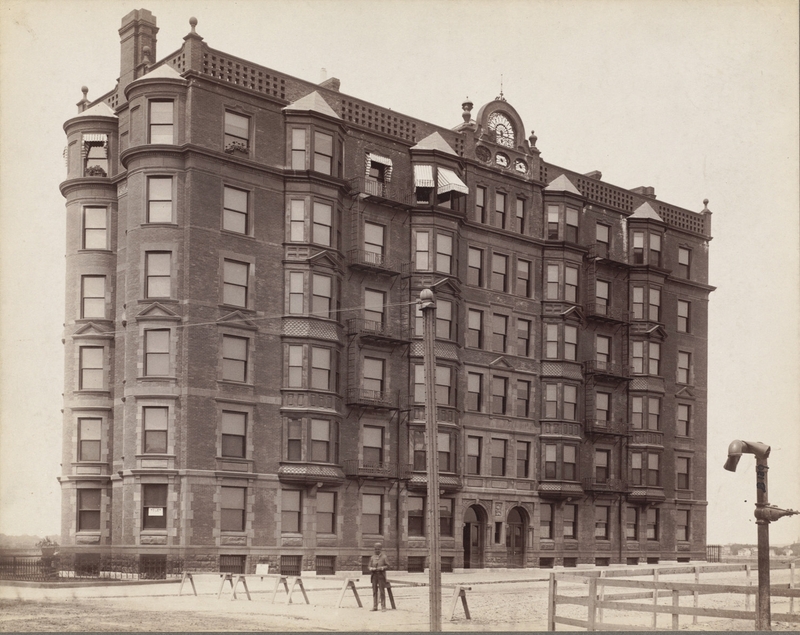 He purchased the land for 504 Beacon on March 1, 1889, from Edmund D. Barbour, who had purchased it on June 2, 1887, from the Boston and Roxbury Mill Corporation. Click here for an index to the deeds for 7-9 Massachusetts/504 Beacon. 7-9 Massachusetts Avenue was built as a thirteen unit apartment house. The Massachusetts Avenue façade is arranged symmetrically, with two entrances in the middle, presumably one for the apartments on the north side (7 Massachusetts Avenue) and the other for the apartments on the south side (9 Massachusetts Avenue). Gamaliel Bradford named the building The Austerfield (or Hotel Austerfield) in honor of the birthplace of his ancestor, William Bradford, second governor of Plymouth Colony. 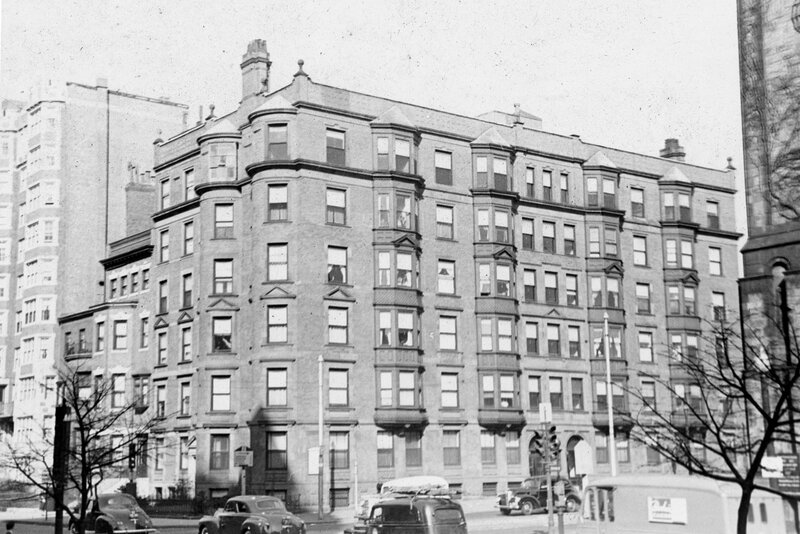 The Austerfield was the first building built on the north side of Beacon between Massachusetts Avenue and Charlesgate East. Consistent with the restrictions contained in the deed of land from the Boston and Roxbury Mill Corporation, the southern façade was set back twenty feet from Beacon. The building extended north the full length of the block to Back Street. Although the entrances were on Massachusetts Avenue, the address in the City Directories was 502 Beacon. 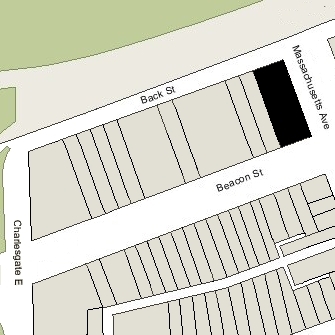 On February 24, 1890, after The Austerfield was completed, Gamaliel Bradford entered into an agreement with the other owners of land on the block limiting (until January 1, 1905) the depth of any new buildings to 90 feet from the north line of Beacon (with bays and other projections limited to extending another 5 feet), and limiting the height of stables and other ancillary buildings further north to no more than 12 feet in height. Gamaliel Bradford lived at The Austerfield from the time it was completed and also maintained a home in Wellesley Hills. He was a widower, his wife, Clara Crowninshield (Kinsman) Bradford, having died in June of 1866, and his unmarried sister, Sarah Hickling Bradford, lived with him. A former banker, he had retired in 1868 to devote himself to civic and political affairs. Prior to the Civil War, he had been an ardent abolitionist, and after the war he took up the cause of municipal reform. He also was a founder of the Boston Anti-Imperialist League, formed to oppose United States annexation of the Philippines. 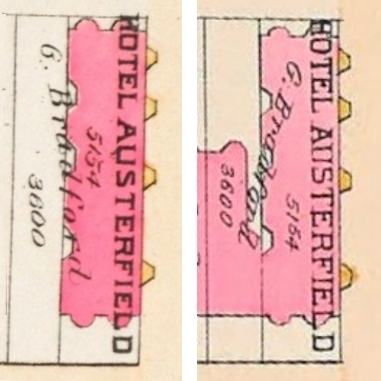 After 1894, the address of The Austerfield usually was shown as 502 Beacon in the Blue Books and as 9 Massachusetts Avenue in the City Directories. Gamaliel Bradford died in August of 1911 from injuries suffered when he was hit by an electric trolly car in Wellesley. In his will, he left all of his property to his son, Gamaliel Bradford, Jr., his only child. Gamaliel Bradford, Jr., was a biographer, poet, critic, and dramatist; he and his wife, Helen Hubbard (Ford) Bradford, lived in Wellesley Hills. Sarah Bradford continued to live at The Austerfield during the 1912-1913 winter season, but moved thereafter. John Long was an attorney and served as a state legislator, Lt. Governor, and — from 1880 to 1882 — as Governor of Massachusetts. From 1883 to 1888, he was a Member of Congress, and from 1897 to 1902 he was US Secretary of the Navy. He and his wife, Agnes (Peirce) Long, lived in Hingham. 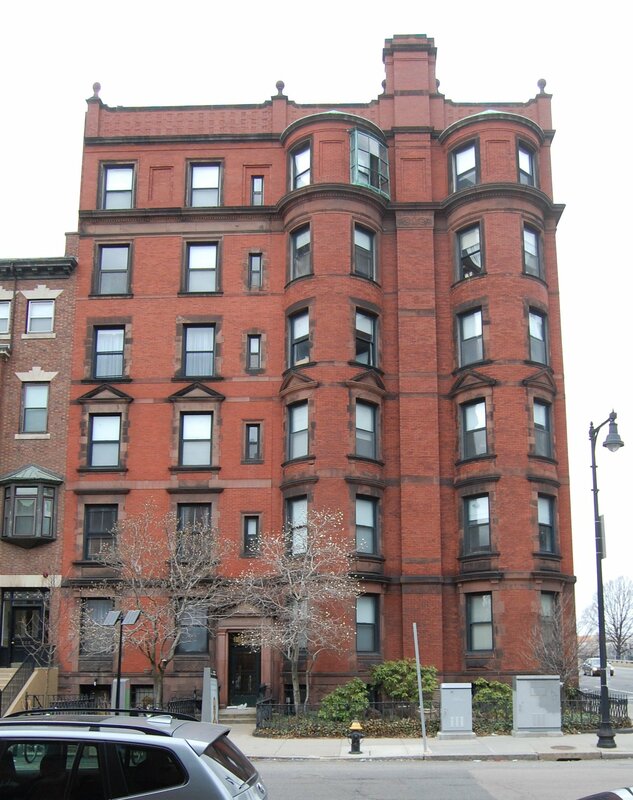 On May 31, 1914, 7-9 Massachusetts Avenue and 504 Beacon were acquired by real estate investor Gordon Dexter. He and his wife (and first cousin) Annie Linzee (Amory) Dexter, lived at 55 Beacon and in Prides Crossing. In January of 1932, the Charlestown Five Cents Savings Bank foreclosed on a mortgage it held on 7-9 Massachusetts Avenue and 504 Beacon and took possession of the property. In March of 1932, the property was acquired from the bank by real estate dealer Ray C. Johnson. In March of 1936, he applied for (and subsequently received) permission to consolidate 7-9 Massachusetts Avenue and 504 Beacon as a single property and to convert the combined building into 32 apartments and offices. The remodeling was under the direction of realtor Harold L. Niles, whose firm – Niles Management Company – subsequently managed and later owned the building. Plans for the remodeling, designed by architect Hyman Felderman, are included in the City of Boston Blueprints Collection in the Boston Public Library’s Arts Department (reference BIN P-134). From about this time, the property was known as 504 Beacon. In September of 1940, 7-9 Massachusetts Avenue/504 Beacon was acquired from the Charlestown Penny Savings Bank by Eva Matthews, and in April of 1941, it was acquired from her by Niles Management, Inc. In June of 1957, the property was acquired by Michael Bencion Moskow individually and as trustee for the benefit of his brother, Jeremy I. Moskow, and their sister, Marina (Moskow) Kaufman, the wife of Robert Kaufman, individually and as trustee for the benefit of their sister, Wendy Moskow, all as partners doing business as Charles Riverside Co. In May of 1971, Michael Moscow acquired interests of Marina Kaufman and thereafter held the property in his own name. In June of 2012, Michael Moskow transferred 7-9 Massachusetts Avenue/504 Beacon to the Five Hundred Four Beacon LLC. The LLC was managed by Moskow Holdings Inc, of which Michael Moskow was the manager of record. 7-9 Massachusetts Avenue/504 Beacon remained an apartment building in 2018.